 SGS AND FDA APPROVED：It has passed the SGS test and the FDA authentication.Product Size: (20.0 x 12 x 19.1)"(L x W x H). 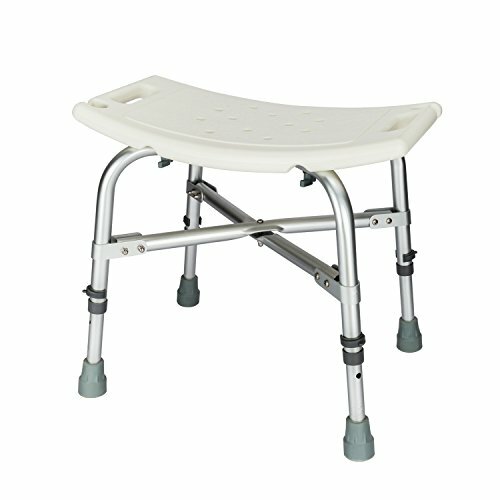  ADJUSTABLE HEIGHT- Adjustable Height: (14.2~19.1)".legs work for all heights or provide stability on uneven floors. New design brings comfort with a wide contoured. Drainage holes reduce slip-through items.  UPGRADE FRAMEWORK: Frame has width/depth cross braces attached with aircraft-type rivets. Anti-slip rubber feet are on each leg offering more support and no sliding on a wet surface; the bench seat is lightweight yet durable and strong.able to hold up to 450pounds.  GREAT GIFT:Easily assemble the lightweight shower seat without the use of any tools. Tool-free removal of legs make storage and travel easy and convenient.It's the best choice as the gift to family and friends.